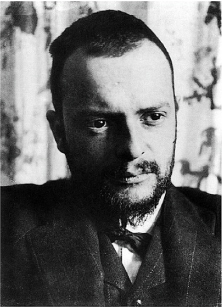 Paul Klee was born in Münchenbuchsee, Switzerland in 1879. His father, Hans Klee, was a music teacher, and mother, Ida Frick, had trained to be a singer. Paul was the second of two children. Paul took an interest in music and drawing at a young age. By the age of seven he was playing the violin, and at age eight he was given a box of sidewalk chalk by his grandmother. In the beginning his parents encouraged the development of his musical skills, though in his teen years he decided to focus on becoming an artist. In 1898, with his parent's reluctant permission, Klee began studying art at the Academy of Fine Arts in Munich. He showed talent in drawing, though struggled to develop a sense for color and felt that he might never learn to paint. Klee traveled to Italy in 1901, after receiving his Fine Arts degree. While there he studied the master painters of past centuries. The colors of Italy excited him, though he recognized that a long struggle was in store for him in understanding how to use coloring in his art. 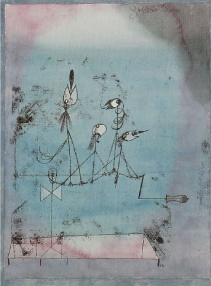 By 1905 Klee was developing experimental art techniques, and beginning to exhibit his works. Though very interested in his art, Klee was still dividing his time between his art, music, and writing concert and theater reviews. In 1906 Klee met and married German pianist Lily Stumpf, and settled in Munich, Germany. They soon gave birth to their son Felix Paul. To provide for their family, his wife taught piano lessons while he tended to the needs of their house and continued to develop his art skills. In 1911 Klee met Wasilly Kandinsky and Franz Marc, artists who would dramatically affected the course of his artistic life. Together they would form Der Blaue Reiter (The Blue Rider), a group that was fundamental to the Expressionist art movement. In 1914 Klee's art changed dramatically during a visit to Tunisia. He was impressed by the quality of light there, and wrote, "Color has taken possession of me; no longer do I have to chase after it, I know that it has hold of me forever... color and I are one. I am a painter." Paul Klee died in 1940 in Muralto, Switzerland. A founding member of the Blue Rider group, he produced almost 10,000 works in a variety of media. Among his most popular works are the Twittering Machine (1922), Park Near Lucerne (1938) and Ad Parnassum (1932). Twittering Machine is a childlike work of a group of birds shackled to a wire, attached to a hand crank. 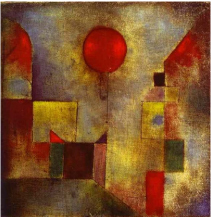 Red Baloon is one of Klee's later works, when his sense of color was more fully developed.